Pounding of meat is performed for various purposes. 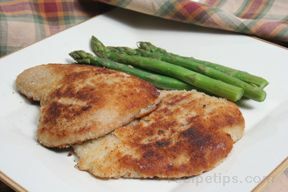 Meat is pounded to tenderize, to even out the thickness of some cuts so that they cook more evenly, and to form cutlets. A mallet is often used to pound the meat and there are many different types of mallets available. If you do not have a mallet, use the bottom of a heavy bottle or pound with a rolling pin. 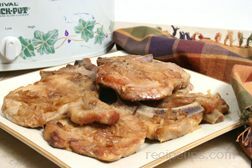 To make pork cutlets, place a boneless piece(s) of meat between plastic wrap and pound until the pieces have been flattened and are an even thickness throughout. 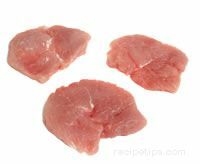 The meat for the cutlets is generally taken from the tenderloin or loin cuts and should have most of the fat trimmed off before pounding. 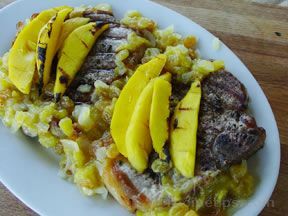 This process is used primarily for presentation purposes. 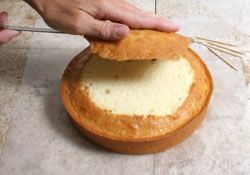 It provides an attractive piece when served. 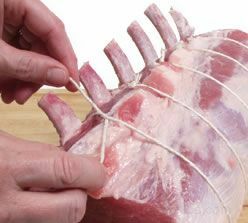 Frenching is the cutting away of the fat, gristle and meat at the end of the bone on rib chops, crown roasts and rib roasts. 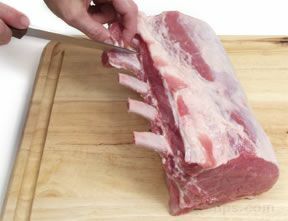 The bone is scraped with a sharp knife to clean 1 to 2 inches of the tip of the bone before cooking. 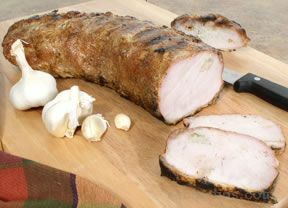 Barding is used on very lean cuts of meat that will be roasted to provide moisture while cooking. 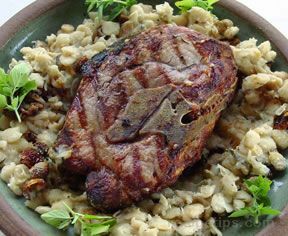 Very thin slices of pork fatback or bacon are wrapped around the outside of the roast and then are tied to secure in place. 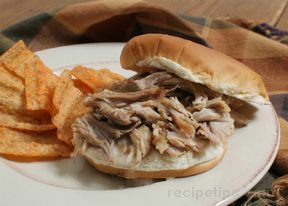 The fatback or bacon is generally discarded when the meat is done cooking. 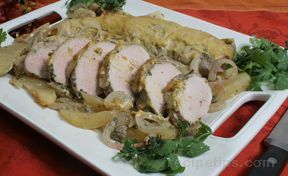 Slices of pork fatback or bacon are also wrapped around tenderloin medallions to provide moisture during the cooking process. 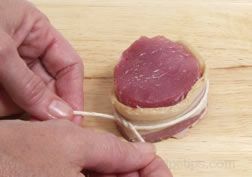 Cut a string approximately 10 to 12 inches in length and then tie around the bacon to secure it in place. Tie in a knot and then trim strings to 1/4 inch. 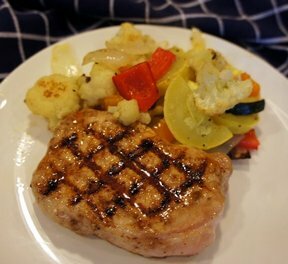 Ground pork is not as readily available as ground beef but on the occasions that you need it you can easily grind it yourself. By grinding it yourself, you can be sure of what cut of meat is used and how lean it is but be sure to trim gristle and tendons before grinding. Do not grind meat until you are ready to use it because ground meat deteriorates in quality rather quickly. 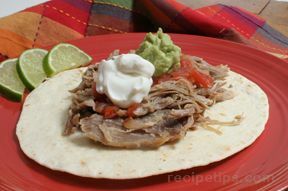 Several methods used for grinding meat are shown below. 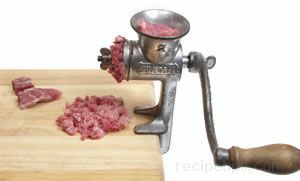 Meat Grinder - A hand grinder can be used to grind meat into a coarse or fine grind, and this method produces the most evenly ground meat. Some electric mixers also have attachments for grinding meat. Food Processor - Meat can be ground by placing cubes in a processor and using the pulsing action to grind them. 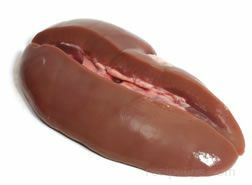 The meat should be stirred between pulses to provide an even grind. 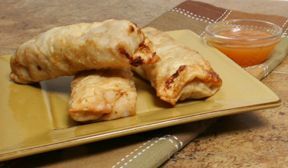 Be careful of over processing, this will result in the meat having a pasty texture and it will be tough when cooked. 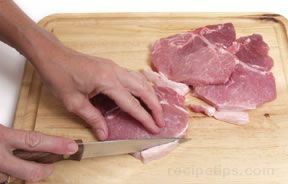 Hand Chopping - Cut meat into cubes and then continue to cut the cubes into smaller pieces until the meat is the consistency that you desire. 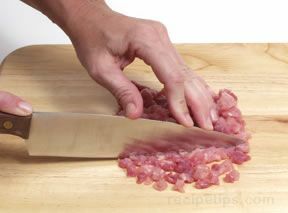 Hand chopping will provide firmer ground meat than the other methods. When trimming the fat from the cuts before grinding, it is best to leave a little fat with the meat to add flavor and tenderness to the ground meat. 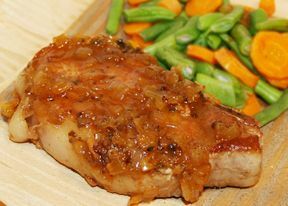 It can have additional flavor added once the meat is ground by adding flavorings such as garlic, onions, herbs, and spices.